Welcome to our Lenten series "40 Days for Vocations." Happy Holy Thursday! That is not hyperbole. It is simply true. The Eucharist is everything. And by that I mean - it is worth more than everything, it matters more than everything, and without it everything else is worthless. This is, of course, one of the many reasons why priesthood is so precious. Without priests, we would not have the gift of the Sacraments. This morning, in cathedrals across the country (and around the world) the priests of the entire diocese gather together with their bishop for the Chrism Mass. They will bless the Holy Oils of Catechumens and the Sick and they will consecrate the Chrism Oil. If you have never been to a Chrism Mass, you might consider trying to go this year. It is an absolutely beautiful liturgy! The first time that I went to a Chrism Mass I was surprised, though. It wasn't just about consecrating and blessing the Holy Oils. It was about celebrating the gift of the priesthood. As any long time readers know, my husband teaches Greek at our archdiocesan seminary. (Special shout-out to all the seminarians who read this blog!) He just began teaching there this year, and the experience has been wonderful not only for him, but for our entire family. But I have to share with you, what a gift it is as a young wife and mother to be able to pray and eat with these seminarians. I stand at the back of the chapel sometimes, and my heart feels so full, looking out over the sea of cassocks and albs. To think that God called all of these young men to the priesthood...and they are saying yes! What hope it gives me as a mother to see the future priests who will be leading our Church as my children grow up. They are real. They are down to earth. But they are also glancing toward heaven. The young men that our family has come to know at the seminary are faithful to the Church and in love with Her, friendly, funny, intelligent, humble, eager to show welcome, and have a great sense of humor. They are real young men. And they are bringing all of that, all of those gifts to Christ and His Church. So now, fast forward to the Mass of the Lord's Supper this evening, the beginning of the Sacred Triduum. The focus is two-fold - the gift of the Eucharist and the Mandatum. The Mandatum recalls when Jesus washes the Apostles feet, and gives them the charge to do likewise. 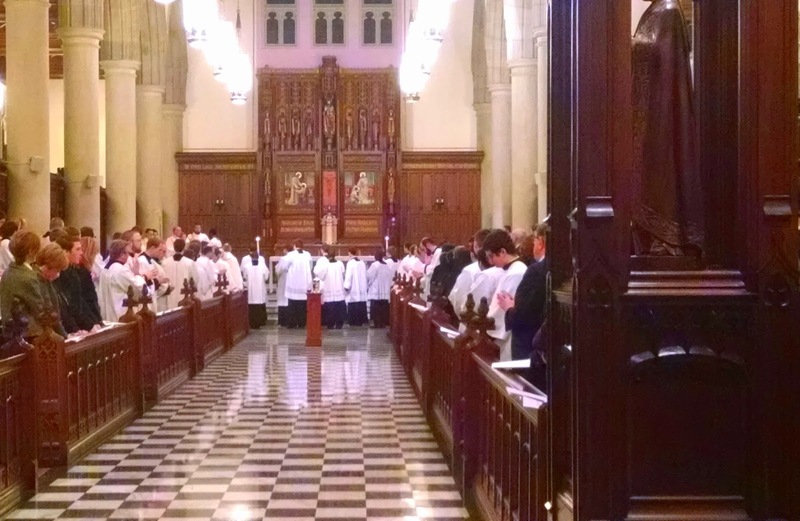 It is, again, a celebration of the gift of the priesthood. It is not only a call to all of us, to serve one another. It is a reminder that that is the call of our priests. So this Holy Thursday (and every day) let us pray for our priests and seminarians, thanking God for the gift of their vocation, and praying that He strengthen them in their work.